A fool refers to someone being ignorant and confused about matters; someone duped, an unwise person or a madman. Douglas Adams in Mostly Harmless (1992). Aeschylus in Fragments, Fragment 383, as translated by Morris H. Morgan. Aeschylus, Prometheus Bound (c. 478 BC), as translated by David Grene. Robert Benchley, quoted in The New Speaker's Treasury of Wit and Wisdom‎ (1958) by Herbert Victor Prochnow, p. 129. Trouble comes looking for you if you’re a fool. Gregory Benford, To the Storming Gulf, (Originally published in Fantasy & Science Fiction, April 1985. Reprinted in the collection In Alien Flesh, 1986). FOOL, n. A person who pervades the domain of intellectual speculation and diffuses himself through the channels of moral activity. He is omnific, omniform, omnipercipient, omniscience, omnipotent. He it was who invented letters, printing, the railroad, the steamboat, the telegraph, the platitude and the circle of the sciences. He created patriotism and taught the nations war -- founded theology, philosophy, law, medicine and Chicago. He established monarchical and republican government. He is from everlasting to everlasting -- such as creation's dawn beheld he fooleth now. In the morning of time he sang upon primitive hills, and in the noonday of existence headed the procession of being. His grandmotherly hand was warmly tucked-in the set sun of civilization, and in the twilight he prepares Man's evening meal of milk-and-morality and turns down the covers of the universal grave. And after the rest of us shall have retired for the night of eternal oblivion he will sit up to write a history of human civilization. William Blake, The Marriage of Heaven and Hell (1790–1793). Translation: A fool always finds one still more foolish to admire him. Nicolas Boileau-Despréaux, L'Art Poétique (The Art of Poetry), Canto I, l. 232 (1674). The three greatest fools of History have been Jesus Christ, Don Quixote . . . and me! The three greatest fools (majaderos) of history have been Jesus Christ, Don Quixote — and I! As quoted in Simón Bolívar and Spanish American Independence, 1783-1830 (1968) by John J. Johnson and Doris M. Ladd, p. 115. The three greatest idiots in history, have been Jesus Christ, Don Quixote, and myself. As quoted in Nineteenth-century Gallery : Portraits of Power and Rebellion (1970) by Stanley Edward Ayling, p. 122. In the course of history, there have been three radicals: Jesus Christ, Don Quixote, and... me. The three biggest fools in the world have been Jesus Christ, Don Quixote, and... me. Jesus Christ, Don Quixote and I: three greatest fools of history. I’ve been plowing in the sea. 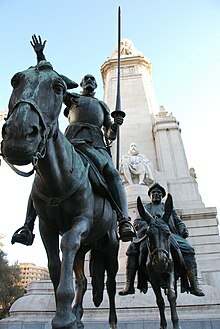 Jesus Christ, Don Quixote and I — the three great mavericks of history. Gene Brown, quoted in Wit (1998) by Des MacHale. The reason why fools and knaves thrive better in the world than wiser and honester men is because they are nearer to the general temper of mankind, which is nothing but a mixture of cheat and folly. Samuel Butler, in Prose Observations. Thomas Carlyle, Latter-Day Pamphlets (1850), no. 6, p. 15, used several times in reference to the citizens of Great Britain. Champ Clark, referring to this remark added, "While the percentage of fools in this country is not so large, there are still enough to fatten the swindlers…. The percentage of fools in this country is not so great as Carlyle states it, but nevertheless it is quite large. "—Champ Clark, My Quarter Century of American Politics (1920), p. 213. You will be amused when you see that I have more than once deceived without the slightest qualm of conscience, both knaves and fools. As to the deceit perpetrated upon women, let it pass, for, when love is in the way, men and women as a general rule dupe each other. But on the score of fools it is a very different matter. I always feel the greatest bliss when I recollect those I have caught in my snares, for they generally are insolent, and so self-conceited that they challenge wit. We avenge intellect when we dupe a fool, and it is a victory not to be despised for a fool is covered with steel and it is often very hard to find his vulnerable part. In fact, to gull a fool seems to me an exploit worthy of a witty man. Giacomo Casanova, Memoirs of J. Casanova de Seingalt (1894). Variant: Wise men profit more from fools than fools from wise men; for the wise men shun the mistakes of fools, but fools do not imitate the successes of the wise. George Chapman in All Fools (1605), act V, scene ii, lines 205–6. This was a common proverb which appeared not only in Chapman's play, first published in 1605, but in other works as well. See The Oxford Dictionary of English Proverbs (1970), p. 927–28. Someone who believes in all the stories of the Baal Shem Tov and the other mystics and holy men is a fool; someone who looks at any single story and says “That one could not be true” is a heretic. William Cowper, Conversation, line 96-97 (1782). I can tell you that only a fool destroys useful things merely because he doesn’t like them. A man is a golden impossibility. The line he must walk is a hair's breadth. The wise through excess of wisdom is made a fool. Ralph Waldo Emerson, Essays: Second Series, "Experience" (1844). Every man is made a fool through his own wisdom. Desiderius Erasmus in "The Praise of Folly". We assemble parliaments and councils, to have the benefit of their collected wisdom; but we necessarily have, at the same time, the inconvenience of their collected passions, prejudices, and private interests. By the help of these, artful men overpower their wisdom, and dupe its possessors; and if we may judge by the acts, arrêts, and edicts, all the world over, for regulating commerce, an assembly of great men is the greatest fool upon earth. Benjamin Franklin, letter to Benjamin Vaughan, July 26, 1784; in Albert H. Smyth, ed., The Writings of Benjamin Franklin (1906), vol. 9, p. 241. The world is filled with fools, but none of them considers himself one, or tries not to be one. Baltasar Gracián, in Maxim 202, The Art of Worldly Wisdom (1647). Hope maketh fol man ofte blenkes. Hope often tricks a fool. Havelok the Dane (circa 1280), Line 307. There are two kinds of fools: one says, "This is old, therefore it is good"; the other says, "This is new, therefore it is better." William Ralph Inge, More Lay Thoughts of a Dean, p. 200 (1931). The foolish have us far more in their power than the wise. If people keep opposing you when you are right, you think them fools; and after a time, right or wrong, you think them fools simply because they oppose you. Randall Jarrell, “Poets: Old, New, and Aging”, p. 44, Kipling, Auden & Co: Essays and Reviews 1935-1964 (1980). What a fool believes he sees, no wise man has the power to reason away. Michael McDonald, Kenny Loggins, Doobie Brothers, What a fool believes (1978). John Stuart Mill, Utilitarianism, Ch. 2 (1861). "The guy goes into the hospital, okay? His wife's just had a baby and he can't wait to see them both. So he meets the doctor and he says, 'Oh, Doc, I've been so worried. How are they?' And the doctor smiles and says, 'They're fine. Just fine. Your wife's delivered a healthy baby boy and they're both in tip-top form. You're one lucky guy.' So the guy rushes into the maternity ward with his flowers. But it's empty. His wife's bed is empty. 'Doc?' He says and turns around and the doctor and all the nurses wave their arms and scream in his face. 'April fools! Your wife's dead and the baby's a spastic!!'" (he executes an asylum orderly with a gunshot to the head) "Get it? Oh what a senseless waste of human life!" There are three kinds of fools in this world, fools proper, educated fools and rich fools. The world persists because of the folly of these fools. Swami Narayanananda, Revelation, No. 190, p. 168 (2001, 1st ed. 1951). I have great faith in fools — self-confidence my friends will call it. Edgar Allen Poe, Marginalia (November 1844). Alexander Pope in "An Essay on Criticism" (1711). For, as blushing will sometimes make a whore pass for a virtuous woman, so modesty may make a fool seem a man of sense. Alexander Pope, Thoughts on Various Subjects, published in Swift's Miscellanies (1727). Alexander Pope, [[w:Epistle to Dr. Arbuthnot|}]. Prologue to Imitations of Horace, Line 84 (1734). A discerning man keeps wisdom in view, but a fool's eyes wander to the ends of the earth. There are foolish people who know and who skillfully use their folly. François de La Rochefoucauld, Maximes (1665–1678), No. 208. Translation: J. W. Willis Bund and J. Hain Friswell (1871). Variant: There are foolish people who recognize their foolishness and use it skillfully. Il n'y a point de sots si incommodes que ceux qui ont de l'esprit. No fools so wearisome as those who have some wit. François de La Rochefoucauld, Maximes (1665–1678), No. 451. Translation: J. W. Willis Bund and J. Hain Friswell (1871). Variant: No fools are so difficult to manage as those with some brains. No Man is so much a Fool as not to have Wit enough sometimes to be a Knave ; nor any so cunning a Knave, as not to have the Weakness sometimes to play the Fool. George Savile, 1st Marquess of Halifax, Political, Moral, and Miscellaneous Reflections, "Moral Thoughts and Reflections" (1750). William Shakespeare, As You Like It, Act v. Sc. 1 (1599 or 1600). Obi-Wan Kenobi to Han Solo, in Star Wars. A young man sees a terribly venomous snake in his small village. Nervous, he watches the snake carefully until it leaves.The young man follows the snake into the forest. He clears the branches out of its path and helps it over obstacles. He even works to keep it fed. Many nights pass and still the young man continues to follow the snake. He even follows it into the sands of the great desert. In the desert, the snake eventually grows hungry. It turns and bites the young man, its poison quickly working its way into his system. Finally curious, the snake looks at the boy as he lays dying and asks, "Why were you foolish enough to follow me all the way out into the desert?" The boy looks back and replies, "Did I follow you? I thought I was leading you away from everyone else..." And then he died. Jolee Bindo to Revan, in Star Wars, Knights of the Old Republic. Jonathan Swift, Cadenus and Vanessa (1713). Translation: Let a fool hold his tongue and he will pass for a sage. Henry David Thoreau, Journal entry (3 February 1860). Fools rush in where angels fear to tread, and the angels are all in heaven, but few of the fools are dead. James Thurber, Further Fables For Our Time", p. 14. Now and then there's a fool such as I. Bill Trader, in the lyrics for "(Now & Then There's) A Fool Such as I". Mark Twain, as quoted in Deduction : Introductory Symbolic Logic (2002) by Daniel A. Bonevac, p. 56. George Villiers, 2nd Duke of Buckingham, in "Letter to Mr. Clifford, on his Human Reason"; also in The Works of His Grace, George Villiers, the Duke of Buckingham (London: T. Evans, 1770) vol. 2, p. 105. The best way in which to silence any friend of yours whom you know to be a fool is to induce him to hire a hall. Nothing chills pretense like exposure. Woodrow Wilson, remarks to the Motion Picture Board of Trade, New York City (January 27, 1916); in Arthur S. Link, ed., The Papers of Woodrow Wilson (1981), vol. 36, p. 17. Woodrow Wilson, “That Quick Comradeship of Letters,” address at the Institute of France, Paris, May 10, 1919. — The Public Papers of Woodrow Wilson, ed. Ray Stannard Baker and William E. Dodd, vol. 5, p. 484 (1927). Edward Young, Love of Fame (1728), Satire II, line 281. Edward Young, Night Thoughts, 1, lines 417–418 (1742). Sand, salt, and an iron weight are easier to bear than the stupid person. but never fools in their folly! when they have no heart to acquire wisdom? This page was last edited on 13 April 2019, at 05:43.